One of the best knitted gifts, in my opinion, is the hat. Over the last few weeks, I've been able to write, knit, block and photograph 7 hats. Most of that time is taken up by the writing and editing. The actual knitting is fast. youth are fussy about their style. Even the ones that don't look fussy have pretty firm opinions about what should be worn. For them, make something very simple in a colour you know they wear. And don't get hurt if they don't wear it. Looking for a hat pattern? Need a hat pattern right away? You can find several right here! And I even have a couple of free patterns for hats. This one, a soft slouchy beanie in Knit Picks Galileo, was made using the How to Knit a Hat Quick Guide that I wrote for Idiot's Guide. (I finally got around to getting a modelled photo.) It's a free recipe that gives you the base numbers you need to design your own hat. Add stripes, colorwork, a pompom, some texture, it's up to you! 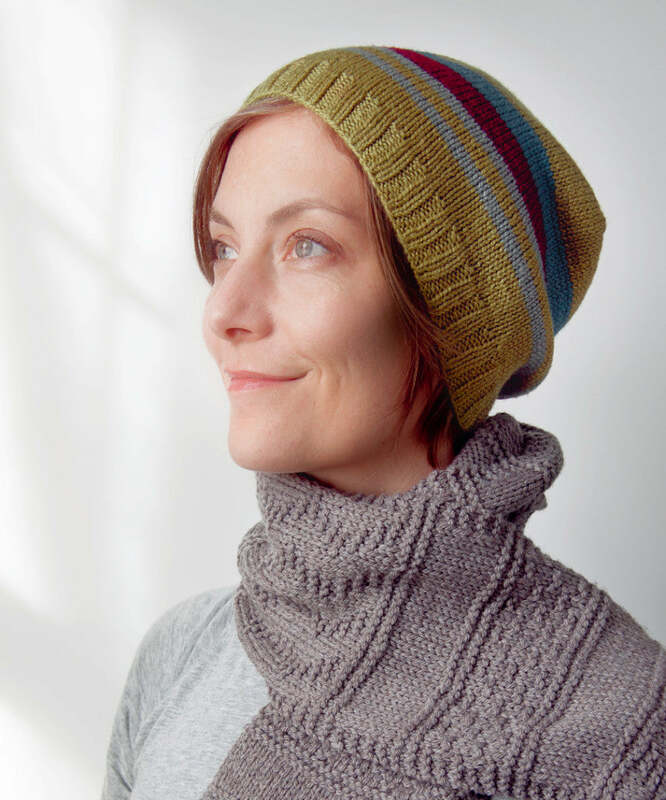 And here's another free knitting pattern for a worsted weight hat, published in the Idiot's Guide to Knitting, and also available as a free sample of the book on the Idiot's Guide site.